Lively guitar and festive sounds come together to create a spicy, delicious collection of music. More laid-back, trippy tunes for your visit to Grooveland. Melancholy and sad tunes to add that emotional touch to your project. Cartoon fun to amuse your customers while they wait for you! Triumphant and uplifting tracks that will spur inspiration in any setting. For when the hero wins the battle, your product outweighs the best, or to simply make your presentation shine. From soft guitar to moving beats to eloquent orchestras, this collection will inspire you and your audience. A head-banging good time. Get ready to rock to these intense guitar riffs, double bass drums, and gnarly solos. Get ready to be loud and aggressive. Let the day start out as physically and mentally demanding as you can imagine. You're working with true grit, tackling the world with boundless courage. And at the end of the day, when you come home you'll know you've done something good. A boot-stomping, hometown festival of sounds which will take you back to summer days at the county fair. Light, casual tunes-like walking down a quiet neighborhood street on a sunny, summer day. This is the kind of music kids need to hear Saturday mornings while they sit with their bowl of Fruit Loops and watch cartoons! Sacred mantras, chants, drones and healing instruments from various spiritual traditions. Recorded in a harmonically beautiful church, this CD creates a beautiful backdrop of healing sound, or it can be used to chant along to. Variety of rock sub-genres that will get you head banging. Perfect if you need a solid collection of guitar riffs, rhythmic bass, and beating drums. 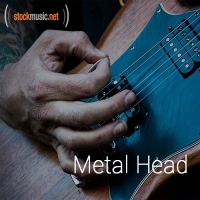 Explore metal, punk, grunge, and more! Direct from the from the center of Swedish Death Metal, Finnish Black Metal and an unknown place somewhere in the Black Forest in Germany arises a dark and scary force too intense to contend with in the physical plane. Surgeries gone wrong, the un-ethical experiment in the lab has been set free. It's dark outside, and a force is coming in the form of this collection of 12 extremely heavy tracks. Be afraid, and project a tremendous amount of energy into your production at the same time. It's incredible how something as simple as the sound of a guitar or a synth pad can completely change the way you feel. Music can become the soundtrack of your life if you let it. All you have to do is completely invest your entire being into the sounds that feed your ears so generously.